Buying Havanas is never a cheap exercise, even in countries where duties are much lower than here. But anyway there is much to be said for our home trade. We have the broadest range, we have a unique security system to combat counterfeits, and a reassuringly long tradition - just think of Winston Churchill! In fact, some people claim that Cuba knows to send only its best cigars here, precisely because of the highly educated market that will receive and scrutnise them. When you're shopping for Havanas, choosing the right tobacconist could be almost as crucial as selecting the right cigar. If you're not sure what you're looking for, the right advice is essential, and you should feel perfectly at ease chatting to staff as they guide you through the options - of which there are many! There are no fewer than 42 shapes and sizes of handmade Havanas, which vary in length from under four to over nine inches and in ring gauge from 26 to 52 64ths of an inch. So, it's not surprising that a first purchase can be rather confusing! There are cigars for morning, noon and night. Any good tobacconist will tell you that you should never follow a full cigar with a lighter one if you smoke more than one a day. You might be asked how long you have available to enjoy your chosen smoke, as well as when you are thinking of settling down to smoke it. The 'vitola' is the size of the cigar, and it should be guided by time. 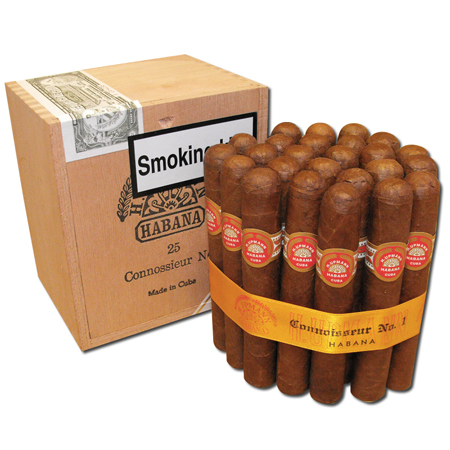 A Havana's flavour develops as it is smoked and you certainly don't want to have to part with it when it is reaching its most enjoyable stage - sometimes not reached until the halfway mark. A good tobacconist will have a good humidor, which should be free from clutter and pleasing to the eye - from the outside as well as the inside. A Havana will age and mellow and, like wine, it will improve for up to 15 years, sometimes longer. In this case, presentation isn't quite everything; your chosen tobacconist should keep Havanas properly as well as displaying them well. Failing to do so could lead to a harsh taste. Havanas should be stored at between 16Â°C and 18Â°C, at a relative humidity of between 65 and 70%. Of these two factors, the relative humidity (RH) is the most important. Most Havanas smoked in Britain are between one and two years old, so if you prefer your cigars with a vintage, buy them now, store them well, and wait. Should you see bloom on any cigar on sale in your tobacconist, this is no disaster. Bloom is actually a healthy sign that the cigar is breathing. It is perfectly acceptable (although often mistaken as mould) for the bloom to be brushed off with a soft brush and the cigar put back on display. Look for the English Market Selection (EMS) guarantee of quality. The colour of this stamp is changed annually to guard against counterfeiters and to indicate the age of the box.